We’ve asked Team Racer-Jerry “Dukes of” Hazard to provide us a review on some tires that he had been using on his Airborne Taka and Maurauder. You’ll be surprised to learn on how much they cost in relation to how well they perform. As always, its too slow to get here, and too soon to pass. The summer riding season is just about past full swing. I’ve finally gotten to that point with my riding where I’m super comfortable with where I’m at skill-wise, enough so that I now can push myself comfortably beyond the edge – take those curves a little faster, let off the brakes more, and boost just a little harder over the gaps. But with all this riding and progression comes a price. Not only bumps and bruises associated with each “next step” , but also wear and tear on our rigs. Consumables are getting near or past the point where safety is now an issue. Time to change out those chains, cables, bleed the brakes, service the forks and bearings, and replace the treads. Nice that most consumables are relatively inexpensive; grips, cables/housings and all. Thrifty riders can change out most everything important under $50. But there’s always a couple parts I will ride until they fail completely – tires being the chief culprit. Good tires, my favorite tires – the Minion DH F (front and rear, please) are simply just not affordable. I can’t really afford to replace them more than once a season. In fact, most of the decent, popular meats cost as much or more per tire than what I pay for my cars’ tires. Meaty center and side knobs combined with a high-volume casing create the ultimate aggressive all-mountain / freeride tire. 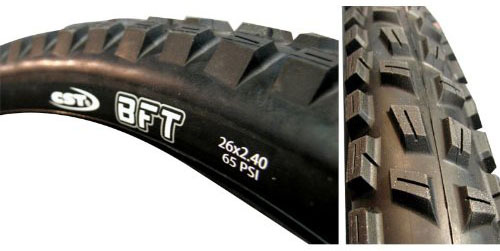 The BFT offers predictable cornering and excellent braking traction, just what you need when the trail gets dicey. The BFT is available with a wire or folding bead with EPS puncture protection. The photo shows the BFT on the left, and the Holy Roller on the right. 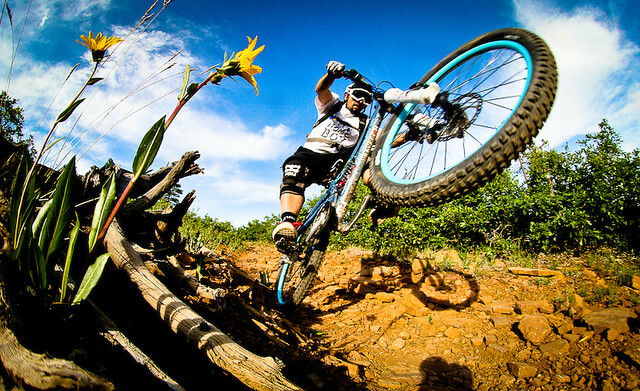 Early this spring, I equipped both my Freeride/AM bike and my DH rig with a pair of BFTs. Up close, the tread pattern has an uncanny resemblance to the Maxxis Holy Roller, though not quite as aggressive with the treads, especially on the edges. The rubber compound feels pretty tough, and though they state there is “EPS puncture protection” included – there is no mention whether the tires are single or dual-ply. I am guessing single. I don’t have an accurate weight at the moment, but they don’t feel overly heavy, again – similar to the Minions. CST calls the BFT out at 2.4, but I feel they err on the side of large, closer to 2.5, are rated up to 65psi. The beads are tight, but not impossible to mount. They slide over my WTB laser disc DH rims, Velocity Blunts and my Sun MTX 33s with a little effort, if you use your man hands, you can probably get them over the rim without tire levers. I air mine up to about 40psi or so on both my AM and DH rigs. Trails around here are pretty seasonal – in the colder weather, it’s usually going to be rocky terrain where there is little snow, and well, little dirt. 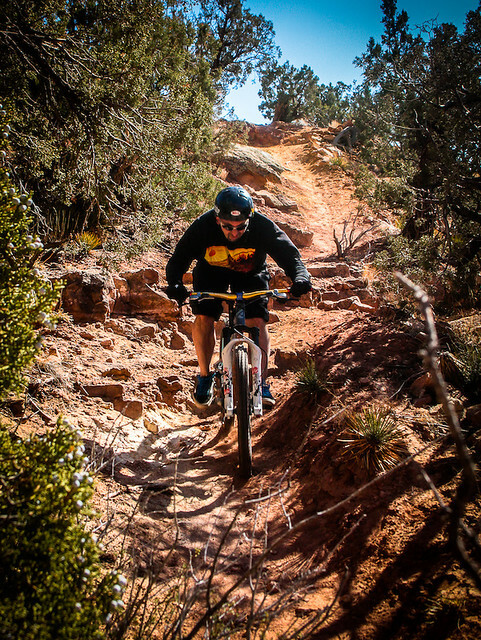 Places like Dave’s trail in Moab and Medicine Trail in Durango are keen because they are exposed and dry when everywhere else is snow or muddy. So the rocks are where I first tried out the BFTs. 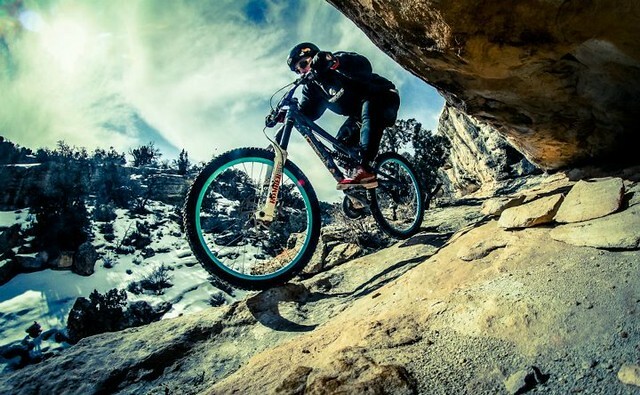 First time out on the BFTs – high desert winter slickrock. Mix of mud, muck, ice, stone and dirt – the BFTs held their own in this wintery mix. Aired down a bit (35psi for me), the tires gave superb traction on New Mexico sandstone. 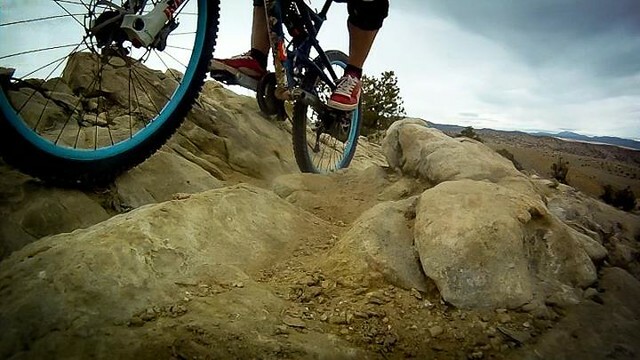 Lots of off camber pokey rocks in the deserts around ABQ (favorite winter getaway for riding). Short, steep climbs and slow, controlled techy descents were no problem. The compound on the CST is not too stiff, not too soft allowing to get grabby in a variety of situations. Brakeless through the rough – CSTs held the line with confidence.. Pushed to the limits of AM to light DH riding, the 2.4 diamter of the BFTs provided enough traction and just a little bit of shock absorption. In a true all-mountain setting, the BFTs did not disappoint. 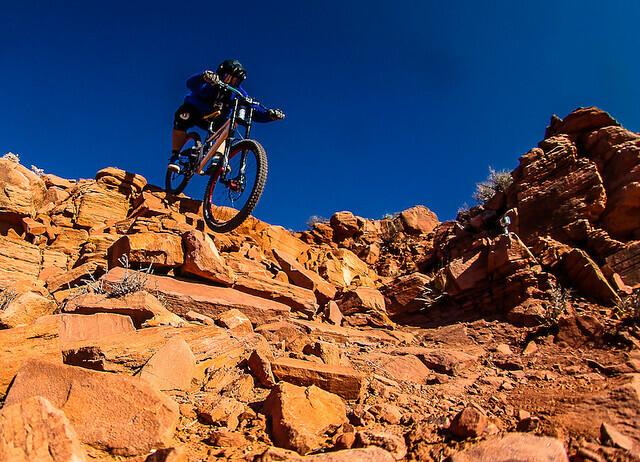 Rocks, bumps, stumps and high-desert dirt, the BFT offered up traction one can trust. This turn is a keen example. The CST BFTs in 2.4 size really held their own in my mixed up all-mountain all terrain world. Rocks, hardpack, and moon dust they did their job well, and were quite durable. They still reside aboard my Airborne Marauder, and unless there’s some drastic changes in tire pricing, they’ll be the replacements when the time comes. Well that covers about half of what I bought the tires for, but how do they compare when trail goes only downwards, fast and furious like? 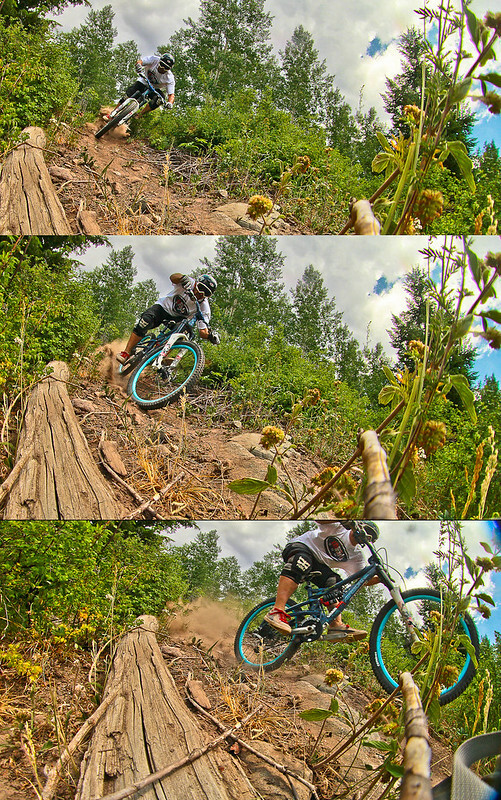 Early seasons Durango loose sand posed no issues on the DH rig with the BFTs. They cut in nicely and held their bite. A bit on the skinny side for a DH tire, they held surprisingly well. In dry hardpack, the BFT does its job as well as anything. 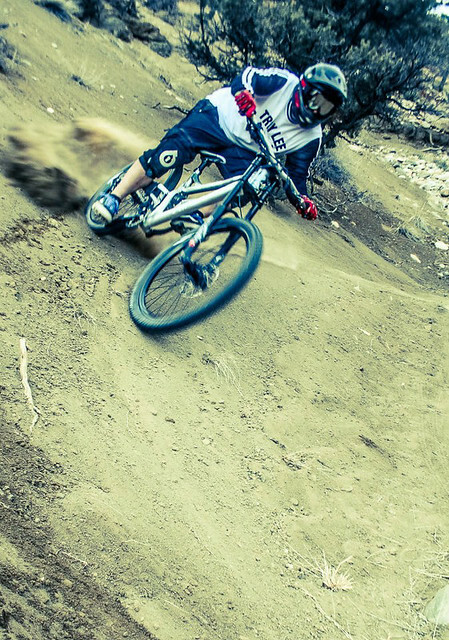 Fully committed in this berm shot, tires were the last thing on my mind. 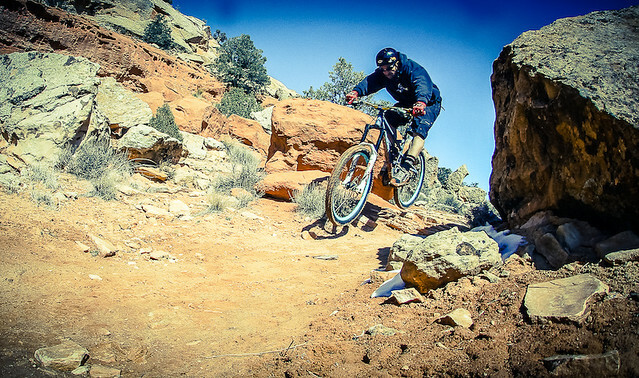 Moab is not the first place that jumps to mind when you think gravity/dh riding, but it’s a little known secret to those in the four corners area that it’s a great winter getaway to get some quick dh shuttles in. 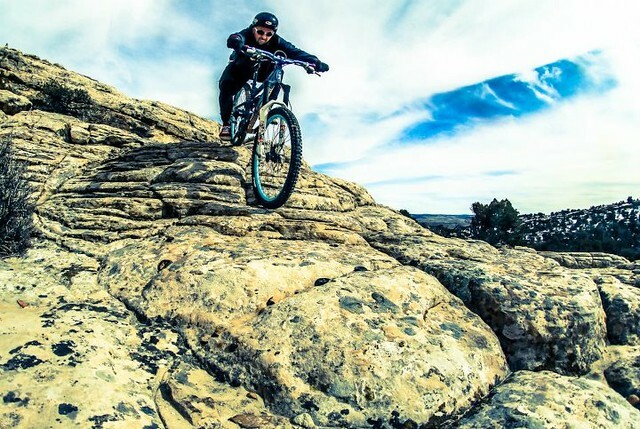 Dave’s trail is almost as rocky as it gets, and with a fresh set of BFTs, I had no worries. In fact, I had a fresh pair mounted on a brand-new set of Sun MTX 33 wheels – I actually put a couple dents to the rim, but the tire didn’t pinch flat or puncture. End of the line. 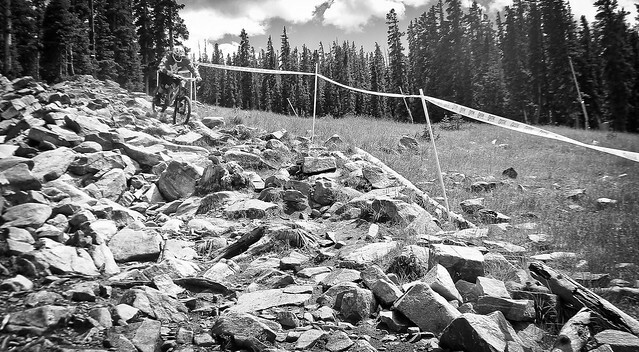 In Keystone, Colorado I found the outer limit of the BFTs – serious rock gardens. A bit more than the tire is made for in my opinion. I pinch flatted both runs through, and ended up swapping out to Minion DHFs in the super tacky dual ply version. On the left is the BFT, and the right we have a Minion DHF. At first, I was a bit bummed but failed to recognize that I’ve been running the BFTs all season (since February) and it was really time to change them out anyhow. 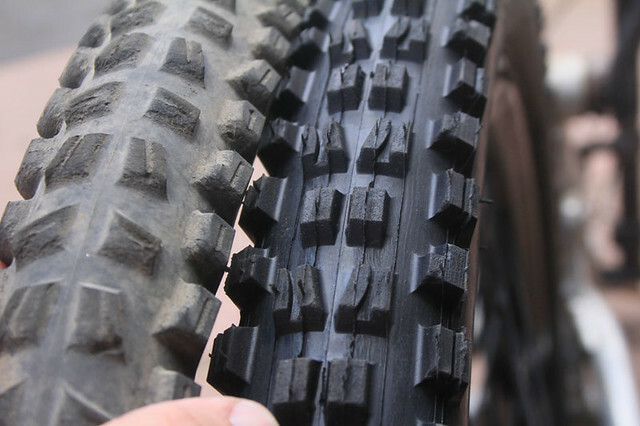 This rider’s conclusion is that the CST BFT is a great tire for all-moutnain/enduro use, even some light downhill. It is a single ply tire, so you get a bit lighter weight, but a bit less durability. I think for the intended use, that’s a fair trade-off. It offers great traction in a wide variety of conditions, and even though it is single-ply, I never pinch flatted in a “AM” situations. 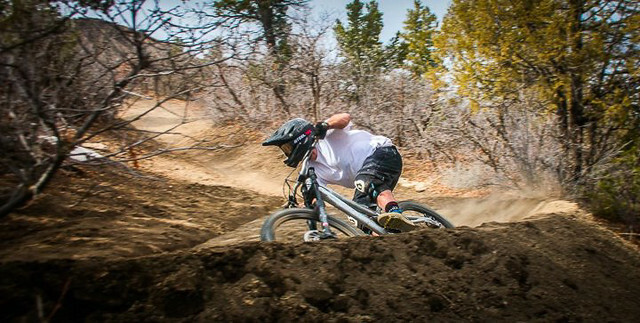 For downhill, I would have to stress the phrase “right tool for the job” – meaning the BFT is probably not the right tool for DH riding. Which is okay, as they’re not really marketed as such. I just like to push things sometimes. While they were fresh, in the first 2 months of riding, I had zero complaints. The BFT was quite resilient in some very harsh circumstances, and their traction was very good on hardpack and rocky situations. However, when the trail became more “dirt orientated”, with a large presence of moist, thick dirt and loam, they failed to hook up as well as proven tire like the Minion or Holy Roller. And once worn in, the performance fades away fast. I was quite surprised to pinch flat twice at Keystone, since I did three trips to Moab for shuttles and had no issue. So, all Mountain? YES, without hesitations. But CST BFT for DH? Going to have recommend against. The BFT offers incredible value and performance, if you keep them in the terrain/usage they are intended. The BFT was previously available via Cambria Bike, however they seem to be out of stock. I have found them available on Amazon for about $25, so they’re still a great deal. Apologies, all references to the Maxxis Holy Roller should actually be referring to the “HIGH ROLLER”. 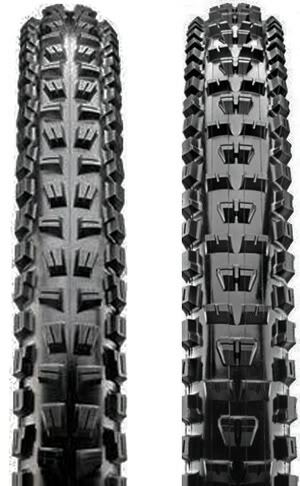 The Holy Roller is more an urban/dj tire with a completely different profile/tread pattern. Thank you – I just rented a bike with the Minion DHF in 27.5×2.8 and loved it. Wanted to try on my own FS 29er without breaking the bank and found the BFT. Sounds like I’m on the right track from your review, I appreciate it! Next PostNext Patches? We don’t need no stinkin’ Patches!